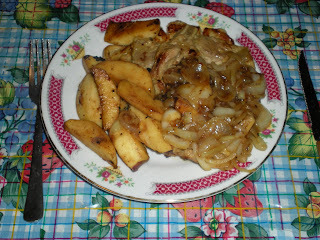 I came across sauteed apples which complements well with pork chops. It is a good way to use near rotten apples. 1. Clean pork chops and pat it dry. Sprinkle curry powder on both sides and rub it with 1/2 tsp of cornstarch. 2. In a large skillet, heat oil over medium heat. Add onion, cook until tender. Transfer to small bowl. 3. In same skillet, cook chops 5 minutes over medium-high heat or until browned. Turn and cook 3-5 minutes longer, until pork just loses its pink color. (To check, simply cut through the thickest part of the meat or near the bone). 4. Transfer chops into plates. Add oil and apples. Sprinkle with sugar, cook until browned. Transfer to plates. 5. In a small bowl, mix apple juice with 1 tsp cornstarch. Stir juice mixture and onion into skillet over high heat, stirring. Boil 1 minute. Transfer and serve with pasta or mashed potatoes.